With the advances in sequencing technology and transcriptome analysis, it is estimated that up to 75 % of the human genome is transcribed into RNAs. This finding prompted intensive investigations on the biological functions of noncoding RNAs and led to very exciting discoveries of microRNAs as important players in disease pathogenesis and therapeutic applications. 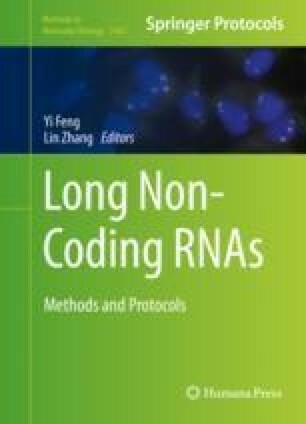 Research on long noncoding RNAs (lncRNAs) is in its infancy, yet a broad spectrum of biological regulations has been attributed to lncRNAs. As a novel class of RNA transcripts, the expression level and splicing variants of lncRNAs are various. Northern blot analysis can help us learn about the identity, size, and abundance of lncRNAs. Here we describe how to use northern blot to determine lncRNA abundance and identify different splicing variants of a given lncRNA. This work was supported, in whole or in part, by the Basser Research Center for BRCA, the NIH (R01CA142776, R01CA190415, P50CA083638, P50CA174523), the Ovarian Cancer Research Fund (X.H. ), the Breast Cancer Alliance, Foundation for Women’s Cancer (X.H. ), and the Marsha Rivkin Center for Ovarian Cancer Research.